Big congrats to Saracens Women on winning the inaugural Premier 15s title, beating Harlequins Ladies 24-20 in the final at Ealing Trailfinders ground yesterday. 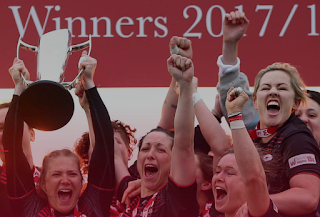 There's little doubt that England’s new elite domestic rugby competition for women has been a huge success, elevating the women's club game in the rugby public's consciousness. The message now needs to spread wider. Mainstream media really do need to get their act together on this, whilst the RFU could help themselves enormously by ensuring that all of the country's elite players - many of whom are gadding about the world playing sevens - are made available more often to play for their respective clubs.